I took this photo of this neglected bag in Starbucks today. 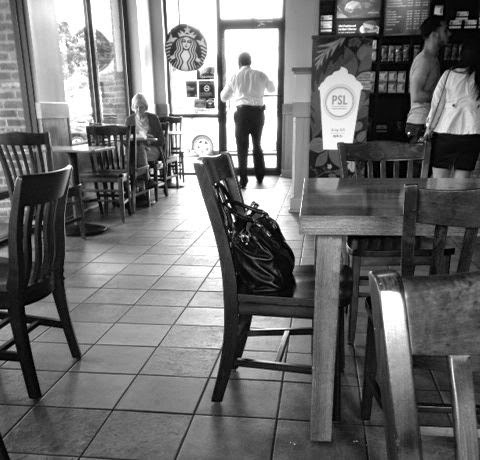 Someone just left their handbag on a chair and went off to line up for coffee with their significant others. I'm not sure they needed to save the table given that the place was fairly empty this morning. However, it did strike me that this bag was all alone, far from pretty much anyone, and no one was watching it! Also, not only was this handbag left unattended, it was also completely open at the top, sort of inviting double trouble. As you can see, no one else seems to be paying much attention...so if someone wanted, I think this large, full handbag could've been a crime statistic in a moment.